Majorca Holidays Free Child Places 2019 @Web2travelDeals. Online Since 2000. Finding the Best Value Holidays with Genuine Free Child Places Majorca from U.K. airports. 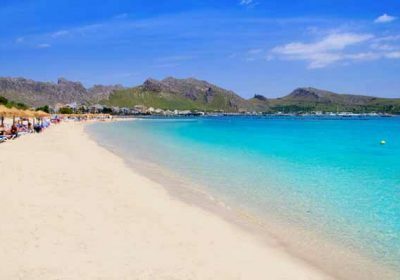 Amazing Deals in Alcudia, Puerto Pollensa, Cala Bona and Playa De Muro. Stop wasting time checking website after website, looking for Majorca Holidays Free Child Places 2019, only to find that the deal advertised has expired or does not exist. View Holidays Genuine Free Child Places Majorca 2019. We understand from reading online reviews, how frustrating it can be for you, when searching for hours for Family Holidays Majorca, only to find that the headline deals advertised are only available in May or September or twice the price during the School Holidays. Majorca Holidays @Web2travelDeals is designed to save you time and money when searching for Free Child Places Majorca 2019. We regularly check with Top Tour Operators to find out which Majorca resorts have holidays from the UK to Majorca with Free Child Places School Holidays. This post Majorca Holidays Free Child Places 2019 shows you hotels and apartments which our team have visited to check that free child places were available during School Holidays, on the date that this post was updated. Get More Information, and claim your Free Child Place Bellevue Lagomonte, Alcudia, Majorca. 7 Nights All Inclusive from £681 p.p. (£2,043 Total family of 4 with 1 X FREE CHILD PLACE INCLUDED) Dep 3rd July 2019 Gatwick. Get More Information, and claim your Free Child Place Hotel Saturno, Alcudia, Majorca. Get More Information, and claim your Free Child Place at Holiday Village Majorca, Cala Millor, Majorca. Get More Information, and claim your Free Child Place Zafiro Ca’n Picafort, Ca’n Picafort, Majorca. Get More Information, and claim your Free Child Place Hotel Haiti, Ca’n Picafort, Majorca. Zafiro Ca’n Picafort, Ca’n Picafort, Majorca. Get More Information and claim your Free Child Place at Zafiro Can Picafort Aparthotel, Ca’n Picafort, Majorca. Protur Aparthotel Bonaire, Cala Bona, Majorca. 4 Star plus. Get More Information, and claim your Free Child Place Protur Aparthotel Bonaire, Cala Bona, Majorca. Get More Information, and claim your Free Child Place Protur Sa Coma Playa Hotel & Spa, Sa Coma, Majorca. Get More Information, and claim your Free Child Place TUI FAMILY LIFE Coma Gran, Sa Coma, Majorca. Get More Information, and claim your Free Child Place Globales Bouganvilla, Sa Coma, Majorca. We are still checking for Majorca Holidays Free Child Places 2019 from other airports. Total price for 7 nts All Inclusive including flights from U.K. (based on family of 4) from £2034. We found free child places on all inclusive holidays to Majorca available with flights from Inverness, Edinburgh, Glasgow, Belfast International, Newcastle, Leeds Bradford, Manchester, Liverpool, Humberside, East Midlands, Birmingham, Bristol, Cardiff, Gatwick, Exeter, Bournemouth, Southampton, Southend, Stansted, Luton, Norwich during July 2018. Saturno Hotel and Hidropark in Alcudia Majorca – 3 star, All Inclusive. 7 nts All Inclusive from £2034 (total family of 4) Dep LGW (21st July 2017) (Deposit £300) Includes One Free Child Place. Saturno Hotel and Hidropark in Alcudia Majorca – 3 star, All Inclusive. 7 nts All Inclusive from £2316 (total family of 4) Dep Newcastle (23rd July 2017) (Deposit £300) Includes One Free Child Place. Saturno Hotel and Hidropark in Alcudia Majorca – 3 star, All Inclusive. 7 nts All Inclusive from £2479 (total family of 4) Dep Edinburgh (7th July 2017) (Deposit £300) Includes One Free Child Place. Majorca Holidays Free Child Places 2019. Hipotel Aparthotel Coma Gran. Sa Coma. Aparthotel Paya Mar, Puerto Pollensa. Protur Aparthotel Bonaire, Cala Bona. Hotel Son Baulo, Ca’n Picafort, Jupiter Hotel, Alcudia. Saturno Hotel, Alcudia. Viva Ca’n Picafort, Ca’n Picafort. Holiday Village Majorca, Cala Millor. This post is designed to save you time and money when searching for Free Child Holidays Majorca. 7 nights All Inclusive holiday for 2 ad & 2 ch. Total Price £2201 with Independent Online Travel Agent (Including Flights and 3 star Sa Coma Hotel) Dep LGW July. SAVE up to £941 against All Inclusive package with Free Child Offer from Tour Operator. Holidays from Tour Operators with Free Child Places generally require a lower deposit (£240 to £300 per family of 4). So if paying a lower amount now is more important than the total cost you may be better booking with one the Top Tour Operators using one of the shortcut links below. Holidays from Tour Operators with Free Child Places generally require a lower deposit (£250 per family). This post Majorca Holidays Free Child Places 2018 shows you hotels and apartments which our team have visited to check that free child places are available. At the time of posting there were still free child places available. However, we also found that it was possible to Save up to £379 on the family of 4 price when you book Flight Plus Hotel Holiday with Online Travel Agent rather than Tour Operator. To obtain these savings you will normally have to pay a higher deposit. Protur Atalaya Apartments in Calla Millor, Majorca – 3 star, Self Catering. 7 nts Self Catering from £449 (£1347 total family of 4 inc free child place) Dep 24 Jul 2018, Belfast International. (Deposit £300). Son Baulo Hotel in Ca’n Picafort Majorca – 3 star, Half Board. 7 nts Half Board from £1878 (total family of 4 inc free child place) Dep Glasgow July. (Deposit £250) Free child places may be available. Playa Mar Aparthotel in Puerto Pollensa Majorca – 4 star, Self Catering, 1 Bed Apartment. 7 nts Self Catering from £1836 (total family of 4 inc free child place) Dep Glasgow July. (Deposit £250) Free Child Places Available. Protur Aparthotel Bonaire in Cala Bona Majorca – 4 star plus, Self Catering, 1 Bed Apartment. 7 nts Self Catering from £1857 (total family of 4 inc free child place) Dep Glasgow July. (Deposit £250) Free child places may be available. Hipotels Coma Gran Apartments in Sa Coma Majorca – 4 star, Self Catering, 1 Bed Apartment. 7 nts Self Catering from £1800 (total family of 4 inc free child place) Dep Glasgow July. (Deposit £250) Free child places may be available. Jupiter Saturno HotelAll Inclusive. 7 nts All Inclusive from £2201 (total family of 4 inc free child place) Dep Glasgow July. (Deposit £250) Free Child Places Available. Viva Ca’n Picafort in Ca’n Picafort Majorca – 5 star, All Inclusive. 7 nts All Inclusive from £2568 (total family of 4 inc free child place) Dep Edinburgh July (Deposit £250). Free child places may be available. Holiday Village in Cala Millor Majorca – 5 star, All Inclusive. 7 nts All Inclusive from £2862 (total family of 4 inc free child place) Dep Edinburgh July. (Deposit £250). Free child places may be available. Sol De Alcudia Hotel, 3 star Hotel in Alcudia, Majorca – 1 Bed Apartment. 7 nts Self Catering from £1622 (total family of 4 inc free child place) Deposit from £250. Holiday Village in Cala Millor Majorca – 5 star, All Inclusive. 7 nts All Inclusive from £2946 (total family of 4 inc free child place) Dep Glasgow July. (Deposit £250). Free child places may be available. Lagotel Hotel & Apartments, 3 star plus Hotel in Playa De Muro, Majorca. 7 nts All Inclusive from £1703. (total family of 4 inc free child place) Deposit from £250. Jupiter Saturno Hotel, 3 star Hotel in Alcudia, Majorca. 7 nts All Inclusive from £2211 (total family of 4 inc free child place. Deposit from £250. Majorca Holidays Free Child Places 2019 are also available for the hotels and apartments listed below. Alcudia, Majorca 3 star Club Mac Alcudia Resort & Waterpark. Free child places may be available. 3 star Siesta Apartments. Free child places may be available. 3 star Sol De Alcudia Apartments. Free child places may be available. 3 star Aparthotel Aquasol. Free child places may be available. 3 star Sol Alcudia Center Aparthotel. Free child places may be available. 3 star Sea Club Alcudia. Free child places may be available. 3 star Ola Isabel. Free child places may be available. 4 star Inturotel Esmeralda Resort. Free child places may be available. 3 star Sol Cala d’Or Apartments. Free child places may be available. 3 star Cala D’Or Playa Apartments. Free child places may be available. 3 star Prinsotel Alba. Free child places may be available. 4 star Cristina Villas. Free child places may be available. 3 star Intertur Aparthotel Hawaii Torrenova. Free child places may be available. 3 star Aparthotel Playa Cas Saboners. Free child places may be available. 3 star Globales Nova. Free child places may be available. 4 star Prinsotel La Dorada. Free child places may be available. 4 star Viva Tropic. Free child places may be available. 4 star Aparthotel Duva & Spa. Free child places may be available. 3 star Pirates Village. Free child places may be available. 4 star Fergus Style Cala Blanca Suites Hotel. 3 star Globales Verdemar. Free child places may be available. Haiti Hotel. in Ca’N Picafort Majorca – 3 star, All Inclusive. 7 nts All Inclusive from £2349 (total family of 4) Dep Edinburgh July. (Deposit £250) Free child places may be available. Sol de Alcudia Aparthotel in Alcudia Majorca – 3 star, Self Catering, 1 Bed Apartment. 7 nts Self Catering from £2380 (total family of 4 inc free child place saving £541) Dep Edinburgh July. (Deposit £250) Free child places may be available. Marina Torrenova in Palma Nova Majorca – 4 star, All Inclusive. 7 nts All Inclusive from £2672 (total family of 4) Dep Glasgow July. (Deposit £250) (Checked 30.04.2014). No Free Child Places Available, but this is a lower price than some holiday deals shown above which have a free child place included. Vell Mari Hotel in Ca’n Picafort Majorca – 4 star, All Inclusive. 7 nts All Inclusive from £2008 (total family of 4) Dep Newcastle July. (Deposit £250) No Free Child Places Available, but this is a lower price than some holiday deals shown above which have a free child place included. Prinsotel La Dorada in Playa de Muro Majorca – 4 star, Self Catering. 7 nts Self Catering from £2022 (total family of 4) Dep Glasgow July. (Deposit £250) No Free Child Places Available, but this is a lower price than some holiday deals shown above which have a free child place included. Marina Delfin Verde in Alcudia Majorca – 3 star, All Inclusive. 7 nts All Inclusive from £2100 (total family of 4) Dep Glasgow July. (Deposit £250) No Free Child Places Available, but this is a lower price than some holiday deals shown above which have a free child place included. Inturotel Sa Marina in Cala d’Or Majorca – 3 star, Self Catering. 7 nts Self Catering from £2128 (total family of 4) Dep Glasgow July. (Deposit £250) No Free Child Places Available, but this is a lower price than some holiday deals shown above which have a free child place included. Hi! Don Pedro in Cala San Vicente Majorca – 3 star, All Inclusive. 7 nts All Inclusive from £2151 (total family of 4) Dep Glasgow July. (Deposit £250) No Free Child Places Available, but this is a lower price than some holiday deals shown above which have a free child place included. Pollentia Club Resort in Puerto Pollensa Majorca – 4 star, Half Board. 7 nts Half Board from £2530 (total family of 4) Dep Glasgow July. (Deposit £250) No Free Child Places Available, but this is a lower price than some holiday deals shown above which have a free child place included. Iberostar Alcudia Park in Alcudia Majorca – 4 star, All Inclusive. 7 nts All Inclusive from £2647 (total family of 4) Dep Glasgow July. (Deposit £250) No Free Child Places Available, but this is a lower price than some holiday deals shown above which have a free child place included. Hi! Condes de Alcudia in Alcudia Majorca – 3 star, Half Board. 7 nts Half Board from £1644 (total family of 4) Dep Glasgow July. (Deposit £250) No Free Child Places Available, but this is a lower price than some holiday deals shown above which have a free child place included. Sol Mirlos Tordos in Palma Nova Majorca – 4 star, All Inclusive. 7 nts All Inclusive from £2865 (total family of 4) Dep Glasgow July. (Deposit £250) No Free Child Places Available, but this is a lower price than some holiday deals shown above which have a free child place included. Inturotel Cala Azul Resort in Cala Esmeralda Majorca – 4 star, Self Catering. 7 nts Self Catering from £1742 (total family of 4) Dep Glasgow July. (Deposit £250) No Free Child Places Available, but this is a lower price than some holiday deals shown above which have a free child place included. Iberostar Ciudad Blanca in Alcudia Majorca – 4 star, All Inclusive. 7 nts All Inclusive from £2732 (total family of 4) Dep Glasgow July. (Deposit £250) No Free Child Places Available, but this is a lower price than some holiday deals shown above which have a free child place included. Viva Tropic in Alcudia Majorca – 4 star, All Inclusive. 7 nts All Inclusive from £3085 (total family of 4) Dep Glasgow July. (Deposit £250) No Free Child Places Available, but this is a lower price than some holiday deals shown above which have a free child place included. Marina Skorpios in Cala Egos Majorca – 3 star, All Inclusive. 7 nts All Inclusive from £2214 (total family of 4) Dep Glasgow July. (Deposit £250) No Free Child Places Available, but this is a lower price than some holiday deals shown above which have a free child place included. Aparthotel Intertur Hawaii Torrenova in Torrenova Majorca – 3 star, Self Catering. 7 nts Self Catering from £1742 (total family of 4) Dep Glasgow Jul. (Deposit £250) No Free Child Places Available, but this is a lower price than some holiday deals shown above which have a free child place included. Iberostar Club Cala Barca in Cala Barca Majorca – 4 star, All Inclusive. 7 nts All Inclusive from £2408 (total family of 4) Dep Glasgow Jul. (Deposit £250) No Free Child Places Available, but this is a lower price than some holiday deals shown above which have a free child place included. Gran Camp de Mar Hotel in Camp De Mar Majorca – 5 star, All Inclusive. 7 nts All Inclusive from £3436 (total family of 4) Dep Edinburgh 14th Jul 2014. (Deposit £250). No Free Child Places Available. Gran Camp de Mar Hotel in Camp De Mar Majorca – 5 star, All Inclusive. 7 nts All Inclusive from £3024 (total family of 4) Dep Gatwick 25th Jul 2014. (Deposit £250). No Free Child Places Available. Delfin Azul Hotel in Alcudia Majorca – 3 star, Half Board. No Free Child Places Available. 7 nts Half Board from £3050 (total family of 4) Dep Stansted 13th Aug 2013. (Deposit £250) No Free Child Places Available. Cala D’Or Playa Apartments in Cala D’Or Majorca – 3 plus star, Self Catering 1 Bed Apartment. 7 nts Half Board from £1659 (total family of 4) Dep Newcastle July. Cheaper without Free Child Places. Belvedere Hotel in San Agustin Majorca – 3 star, All Inclusive. 7 nts All Inclusive from £1539.28 (total family of 4) Dep Newcastle in family room, dep July. HSM Club Torre Blanca Apartments. in Sa Coma Majorca – 3 star, All Inclusive, 1 Bed Apartment. 7 nts All Inclusive from £1407.23 (total family of 4) Dep Newcastle July. No Free Child Places, but a Great Price for All Inclusive Family Holidays in Majorca. Above Availability for Majorca Holidays Free Child Places 2017 is based on information displayed on Tour Operator websites on 29th April 2016 (Unless alternative date shown above).